Many years ago when I was newly married, living in Hawaii and poor (they do go hand in hand in most cases) I needed a bathroom window curtain. Even the 'cheap' curtains were more than I wanted to spend. My husband was in the Navy and money for curtains wasn't in the budget. Hawaii was and is an expensive place to live. One day I received a surprise package from home that contained a beautiful set of towels. I knew I would probably seldom use them as they were too pretty. The person who sent me the towels asked how I liked them. I told a white lie and said they were perfect. They were perfect, inside the closet where they sat, they were perfect. We were quite pleased with the finished product. When my husband came home I went into great detail about the design of the new bathroom window curtain. Then I showed him the towel window curtain and he thought it looked very good. My neighbor was so pleased that she made bathroom curtains out of towels for herself. There are several good reasons to make bathroom curtains out of towels. They come in a large variety of colors, patterns, sizes and prices. They require very little sewing to turn towels into curtains. They are easy to wash, no ironing or special care is required. When you get tired of them as curtains you can take out the stitches and turn them back into towels. 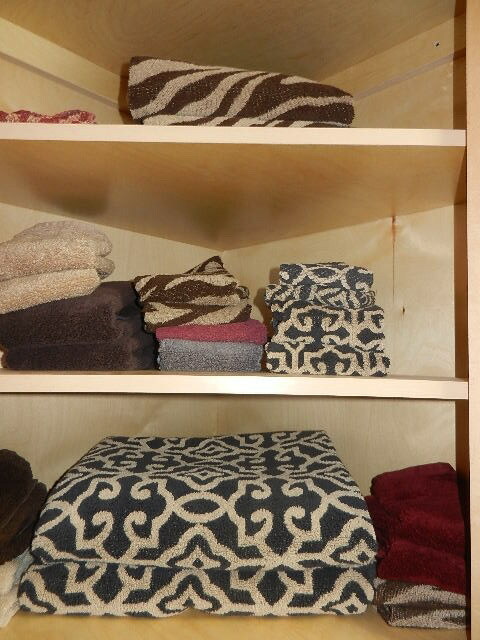 Towel curtains would work well in a laundry room, or even a child's room. Kitchen window curtains or just valences could be made from fancy dish towels. Towel curtains would be very appropriate for a beach house. You could use beach towels for a longer look. Beach towels have such bright bold colors they can do a lot to dress up your space.